He was put through the wringer, constantly traded and never properly informed. Now he’s turned his frustration into a positive with a new app designed to educate prospective players on what they’re in for. Stormer Santana was amped. It was summer 2011, he’d spent the past couple years stopping pucks in AAA with storied Minnesota prep school Shattuck-St. Mary’s, and an exciting new opportunity knocked. Santana had been drafted to North American Hockey League’s Kalamazoo K-Wings and was drawing interest from the Ontario Junior League’s Markham Waxers. Playing Jr. A in Ontario would mean moving much closer to his hometown of Sault-Ste. Marie. He’d learned from Markham’s GM, who was also the coach, that he’d play a major role as part of a tandem. He would mentor a younger goaltender, the owner’s son. The Waxers were hot on Santana. Santana’s parents dropped him off with a new billet family, and he was ready to start his junior career. A week before the team’s main camp, the Waxers fired that coach and GM and hired a brand new coach and GM, who brought in another goaltender from the British Columbia League. All of a sudden, the Waxers had a logjam at the position. Two days before the season started, after uprooting his life, Santana wound up traded to the Hamilton Red Wings. Santana was promised it would be different this time. He arrived in Hamilton to discover his new billet family lived in low-income housing and didn’t have a proper environment for him to live in, so his parents had to help him quickly secure a new billet setup. Fine. Lemons out of lemonade, right? Santana showed up for his first day in the Red Wings dressing room…and found his long-time rival and best friend, also a goalie, packing up his stall. Santana was replacing him and had not been told. What a gut punch. Halfway through that season came the OJHL trade deadline. And guess who ended up changing addresses yet again? Santana. The Red Wings had a chance to bring in a goalie with OHL experience, which added to their team prestige, and Santana was the casualty. His next stop in 2011-12? The Brampton Capitals. And the rocky road didn’t end after that rookie season. That lingering disappointment planted a seed of innovation in Santana when he left hockey to study at the University of Denver. He took a business course there that taught him how to develop apps. He was a natural at it. Every year Denver hosts the Madden Challenge – not the football video game contest, but another one named for a Denver real estate developer – which challenges students to develop their own apps. Santana’s team won his freshman year with an app designed to help roommates easily exchange and disperse funds for their various housing costs. Being a student, Santana was regularly exposed at the time to the website ratemyprofessors.com, in which students give anonymous feedback and ratings for their educators. That’s where the website, his hockey experience and his skill building apps suddenly converged. He had his eureka moment. “I said ‘OK, wow, this is a great platform for students to get information about their potential teachers they’re about enroll with, so I could see this being an applicable resource for athletes as well,’ ” he said. To ensure the reviewers are credible and don’t run smear campaigns, they’re asked to sign in through Facebook. 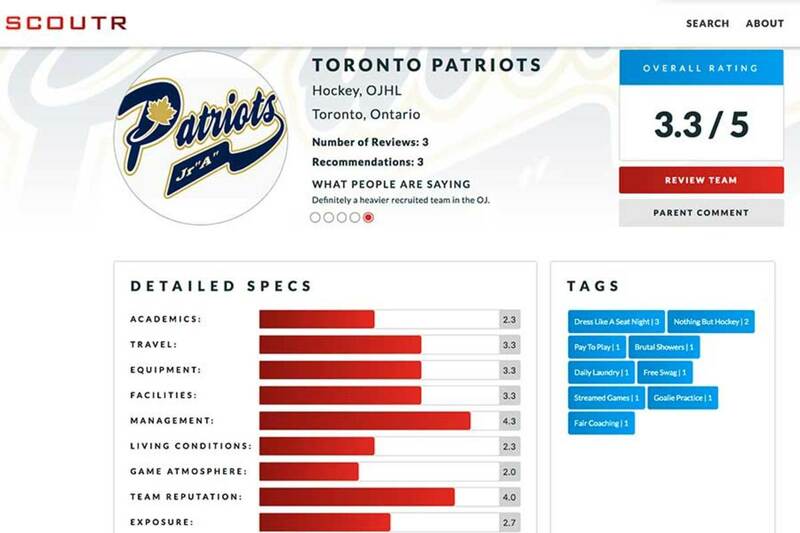 Santana can thus cross-reference their names with websites like hockeydb.com to confirm any athlete actually played on a team he or she reviews. Names aren’t attached to the reviews once they’re posted, ensuring anonymity for the athletes, but their games played and years on the team are. Let’s face it – that does open the door for a player or coach to do some detective work and use those stats to figure out who’s saying what about their team. But it’s still important to share that information so prospective athletes and parents can trust what they’re reading. “If there’s a really negative review with two or three games played, I would definitely take that with a lot less weight than someone that’s played 35-plus games for a team,” Santana said. The app had a social outreach of more than 100,000 people within a week of its launch, Santana said, and already has more than 400 teams reviewed. The collection of leagues includes men’s and women’s and ranges from NCAA Div. I to Div. III, from major junior to Jr. C. Santana has even received suggestions from friends of his who play in the NHL or semipro that he open Scoutr Sports to AHLers, ECHLers or players in Europe. A natural question to ask is: what do the teams think of Scoutr Sports? Santana says he’s gotten the odd prickly reception but that most teams have responded warmly. “I think teams are starting to feel a little threatened by the fact that now they’re under a microscope,” Santana said. “Now they’re being evaluated by their players, and now they really have to start treating players with the transparency and honesty these athletes deserve. Before, prior to Feb. 14, organizations could basically get away with whatever they wanted, and the only way someone was going to find out about was if that player told somebody. For now, Scoutr Sports isn’t yet a for-profit business venture for Santana. He’s offering the app for free as he accumulates more teams and reviews in the service’s infancy. He hopes to monetize it eventually, but his immediate goal is to help athletes avoid enduring what he did as a Jr. A goaltender.